David Gregory, moderator of "Meet The Press" on NBC: "Are U.S. treasury bonds still safe to invest in?" 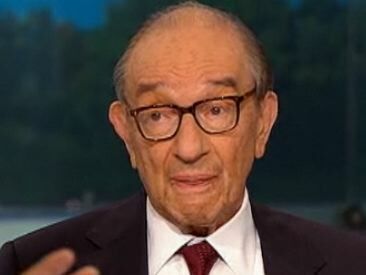 Alan Greenspan, Former Chairman of the Federal Reserve: "Very much so. This is not an issue of credit rating, the United States can pay any debt it has because we can always print money to do that. So, there is zero probability of default." Greenspan says the S&P downgrade was just meant to hit a "nerve" and hurt the "self-esteem of the United States." Sen. Kerry Calls U.S. Credit Change The "Tea Party Downgrade"
Maher To Liberal Panel: Do You Have Any "Buyer's Remorse" With Obama?